History Revealed! homeschool history curriculum from Diana Waring Presents fully integrates the Bible with history. An easy-to-use, multi-level, Charlotte Mason/Unit-Study inspired curriculum that integrates activities for all learning styles, this curriculum is packed with hands-on activities, inspiring readings, engaging audio, and other exercises that teach history from a biblical perspective. Fully integrating the Bible with history, Diana Waring's bestselling Ancient Civilizations and the Bible curriculum is packed with activities, readings, and information specifically designed for students of any learning style. Focusing on studying history from a biblical worldview, textbook units cover chronological portions of history, from Creation & the Flood to the Persians & Medes to Jesus Christ. Every effort is made for students to engage in the material through exploring, researching and using it in a way that makes history lessons meaningful to their lives. By reading the lessons, engaging in the activities, and searching out answers for themselves, students will gain a firm understanding of Ancient Civilizations, the Bible, and the irreplaceable relationship between the two. In the What in the World, Volume 1 CD Set Diana Waring will take you on an archaeological quest to find the important personalities of history; give you a behind-the-scenes view of history-vs.-Scripture controversies; and show you how God's providence was behind every moment of history every step of the way. 4 audio CDs. The Test Kit includes eight unit tests (with short-answer, short-essay, and matching questions) along with test answers. 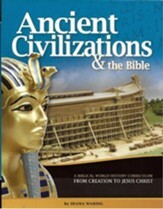 Fully integrating the Bible with history, Diana Waring's bestselling Ancient Civilizations and the Bible is packed with activities, readings, and information specifically designed for students of any learning style. Focusing on studying history from a biblical worldview, units cover chronological portions of history, from Creation & the Flood to the Persians & Medes to Jesus Christ. Each contains four weeks worth of information, online and book readings, discussion questions, research, timeline activities, map work, art, science, music, cooking, drama and a variety of creative activities. Every effort is made for students to engage in the material through exploring, researching and using it in a way that makes history lessons meaningful to their lives. By reading the lessons, engaging in the activities, and searching out answers for themselves, students will gain a firm understanding of Ancient Civilizations, the Bible, and the irreplaceable relationship between the two. 312 pages, softcover. 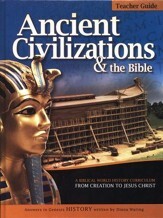 This teacher's guide accompanies Diana Waring's bestselling Ancient Civilizations & The Bible. Suggestions and information is provided on learning styles, three learning modalities and eight intelligences, as well how to best teach this course to whatever combination your student is. Each unit includes one week geared towards each learning style, as they move through audio CDs, timelines, research, hands-on activities and creative expression to gain a full-on experience with each time period. Each unit includes reduced student pages, a chart for each day's activities, spiritual emphasis' in the lesson, teacher notes, background information, scripted discussion questions, explanations of concepts presented in the curriculum, referenced readings & audio, discussion, activities, review, evaluations, research topics, timelines, vocabulary, maps, art, projects and more. 312 pages, hardcover. 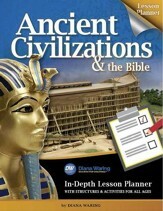 The "Ancient Civilizations & The Bible Lesson Planner" makes teaching and implanting Diana Waring's Ancient Civilizations and the Bible curriculum super-simple for busy homeschooling mamas! "Month at a Glance" pages set up your month with week-by-week summaries and a summary of the content for the textbook chapter. The "Week at a Glance" pages feature a book list and materials list or a "planning your week" worksheet, a day-by-day list for both a 5-day and 3-day plan, and tips to "make it simple" if you happen to be overwhelmed that week. Daily Lesson Plans then provide detailed tasks with checkboxes to check off as you complete each assignment; tasks are divided between Pre-K to 4th boxes and 5th to 12th grade boxes to make it easy to see what needs to be done by which student. There's also record keeping room for high school students to record credits each week. Additional teacher support is given in the introduction, which covers the "8 kinds of smart" reflected in the activities; the "4 phases" of introduction, exploration, hands-on, and expression that the course is organized around; a page of teaching tips for PreK-4, Grades 5-8, and Grades 9-12; and information on teaching in a multi-grade environment. The back of the book contains an 'end of year records' chart. Passing the lessons of history on to young learners is at the heart of Diana Waring's History Revealed Curriculum; this fun activity book brings students through a chronological tour of history with historical pictures, silly songs, maps, mazes, crafts, experiments, puzzles, codes, rhymes, word searches and more. 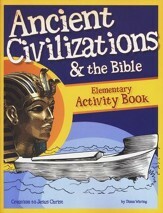 Perfect for use with the accompanying Ancient Civilizations & The Bible, students in grades K-4 will learn and retain the many important events, people and places in ancient history. 80 pages, softcover. Pages are not reproducible. Grades K-4. 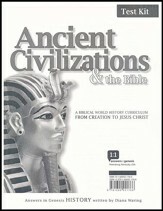 This set of tests accompanies Diana Waring's Ancient Civilizations and the Bible curriculum. While the program offers many non-traditional paths for students to be assessed by (including papers, presentations and more! ), this set of tests may be used for objective evaluation. Nine tests are included, as well as test answer keys. 47 loose-leaf pages. Grades 6-12. Listen in to Diana Waring's always entertaining accounts of the people and events from Genesis through the end of the ancient civilizations. Accompanying the material in What in the World, Vol. 1, this 3-CD set includes short vignettes of history, biographies of fascinating people, and descriptions of amazing historical events. See history through recent archaeological discoveries as well as a biblical lens! From Creation to Christ. 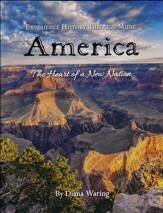 Listen to one of homeschooling's most popular history teachers in What in the World, Volume 1 ! Diana Waring will take you on an archaeological quest to find the important personalities of history; get a behind-the-scenes view of history-vs.-Scripture controversies; and see how God's providence was behind every moment of history every step of the way. 4 audio CDs. See beyond the surface facts of history with Dig Deeper! Three audio CDs will teach students about the amazing things that have happened within the ancient past. Listen to the famed storytelling of Diana Waring as she spins the history of Noah's Ark, the Seven Wonders of the Ancient World and The First Christmas. You'll feel as if you've stepped back in time! 3 Discs. Grades 5-12. Incorporating God's purpose alongside historical facts, students will learn to apply a biblical perspective to every aspect of the years AD 30-1799. Technology, medicine, philosophy and theology were growing in leaps and bounds; looking at history through a Christian worldview is crucial to understanding the myriad occurrences that happened throughout history because of this era. Hands-on activities, exciting reading selections, audio CDs and activities will engage students of every learning style in this student manual. 360 pages, softcover. Grades 6-12. 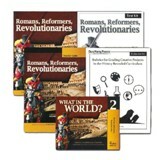 This teacher's guide accompanies Diana Waring's bestselling Romans, Reformers and Revolutionaries Student Manual. Suggestions and information is provided on learning styles, learning modalities and intelligences, including tips on how to best teach this course to your students. Each unit includes one week geared towards each learning style, as children move through audio CDs, timelines, research, hands-on activities and creative expression to gain a full-on experience with each time period. Each unit includes reduced student pages, a chart for each day's activities, spiritual emphasis' in the lesson, teacher notes, background information, scripted discussion questions, explanations of concepts presented in the curriculum, referenced readings & audio, discussion, activities, review, evaluations, research topics, timelines, vocabulary, maps, art, projects and more. 384 pages, hardcover. Passing the lessons of history on to young learners is at the heart of Diana Waring's History Revealed Curriculum; this fun activity book brings students through a chronological tour of history-from the Resurrection of Christ to the American Revolution and Revivals-with historical pictures, silly songs, maps, mazes, crafts, experiments, puzzles, codes, rhymes, word searches and more. 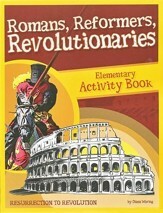 Perfect for use with the accompanying Romans, Reformers and Revolutionaries, students in grades K-4 will learn and retain the many important events, people and places of the past thousand years. 78 pages, softcover. Pages are not reproducible. Grades K-4. 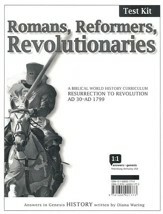 This test kit accompanies Romans, Reformers and Revolutionaries. While the program offers many non-traditional paths for students to be assessed by (including papers, presentations and more! ), this set of tests may be used for objective evaluation. Nine tests are included, as well as test answer keys. 27 loose-leaf pages. Grades 6-12. With catching enthusiasm, Diana Waring's telling of the Vikings, Feudalism, The Renaissance, Seven Years War and other events--from the time of the Romans to the American & French Revolutions--will have you on the edge of your seat! Discover the lives of the movers and shakes of the times, as well as what it was like to live their eras; and how the hand of God guided it all. 4 Audio CDs. Sail the seas, travel to unknown shores and experience the thrill of discovery as Diana Waring takes you back in time! 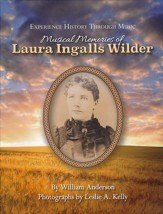 Short historical vignettes, biographical sketches, and descriptions of the glorious (and not so glorious!) 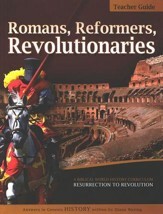 events of history from the Romans to the American Revolution are told in trademark descriptive style. 3 Audio CDs. "Dig Deeper" into the years AD 30-1799 with Diana Waring's famous storytelling! This 3-disc, audio CD package delves into the history of the early church, the medieval church, and the reforming church. Exploring the various elements that went into the church we know today, students will learn of the persecutions, The Great Schism, The Byzantines & Muslims, the Eastern & Western churches, Luther, The Reformation in France, Holland, & England, The Great Awakening and more. 3 CDs. Grades 5-12. Fully integrating the Bible with history, Diana Waring's bestselling World Empires, Missions, and Wars curriculum is packed with activities, readings, and information specifically designed for students of any learning style. 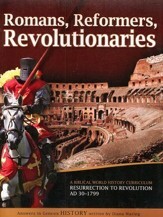 Focusing on world history during the years 1800-1956 lessons offer an explicitly Christian perspective on world events. Covering the Napoleonic Wars alongside the Modern Missions Movement, the Industrial Revolution to Jim Elliot's martyrdom in Ecuador, this curriculum integrates the historic events in the world with Church history. Every effort is made for students to engage in the material through exploring, researching and using it in a way that makes history lessons meaningful to their lives. By reading the lessons, engaging in the activities, and searching out answers for themselves, students will gain a firm understanding of modern world events. With the What in the World, Volume 3 CD Set, listeners will uncover the secrets behind charismatic leaders, religious freedom, racial r econciliation, genocide, atomic warfare, and tyrannical ideologies. This teacher's guide is part of Diana Waring's World Empires, World Missions, World Wars Curriculum. This guide provides an introduction to the teaching methodology of the curriculum, including detailed notes on how to teach each phase. Notes on differentiating instruction begin each unit, and the units themselves have helpful background information and lesson instruction surrounding each reduced-size student page. Recaps, discussion notes, and questions are provided along with some answers (e.g. timeline dates). 450 pages, hardcover. 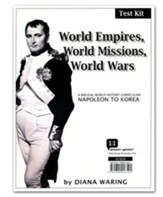 The third year in Diana Waring's History Revealed curriculum, World Empires, World Missions, World Wars focuses on world history during the years 1800-1956. Focusing on interpreting history from a biblical worldview, lessons offer an explicitly Christian perspective on world events. Covering the Napoleonic Wars alongside the Modern Missions Movement, the Industrial Revolution to Jim Elliot's martyrdom in Ecuador, this curriculum integrates the historic events in the world with Church history. The Student Text lessons are designed specifically for homeschoolers who have the freedom to learn through multiple learning styles; students are given multiple options for learning that include visual, auditory, and kinesthetic learning modalities, and lessons integrate the four learning styles and eight intelligences. Units open with a list of key concepts before diving into chapters that clearly explain events with a narrative-style tone. Each unit is then broken into four one-week segments, called phases, which cover multiple learning methods and provide the accompanying activities for the lessons. In Phase 1, the student reads the unit article and then listens to fascinating stories of history told by Diana in the What in the World is Going on Here?, True Tales, and Digging Deeper audio CDs. Discussion questions, critical thinking/comprehension exercises, and a self-evaluation are also included, along with a list of optional additional resources to read. Phase 3 focuses on the geography, arts, and sciences of the period covered through activities in science, art, architecture, cooking, and music. Mapwork exercises ask students to mark physical, geopolitical, and other important information on maps while considering the implications of geography. In Phase 4, students are encouraged to express themselves in their own unique way, choosing a project that may include writing, art, music, drama, movement, conceptual design, or other areas of expression. NKJV Scriptures. 427 pages, softcover. 2nd Edition. This Test kit covers the material taught in the Phase 1 stages of Diana Waring's World Empires, World Missions, World Wars curriculum. Instead of quizzing students on names/places/dates, tests instead allow students to choose the areas which they are most familiar with, reflecting what they choose to focus their studies upon. Nine tests (one for each unit) are included, along with a separate answer key for each test. 9 tests plus answers, glue binding, reproducible for in-family use. 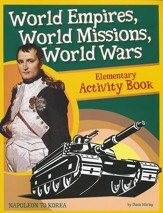 The optional Elementary Activity Book provides a way for younger students to work through the same History Revealed: World Empires, World Missions, and World Wars curriculum as older siblings. Following the same 4-phases as the regular curriculum, mazes, children's songs, art activities, Bible verses to think about, hands-on activities, and simplified narratives provide a way for children in grades K-4 to participate. 82 pages, softcover. Pages are not reproducible. 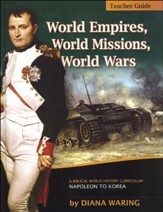 This CD-Set brings the history in Diana Waring's World Empires, World Missions, World Wars curriculum to life. Through engaging audio narratives, True Tales features stories of fascinating people and amazing events from 1800 to the 1950s. 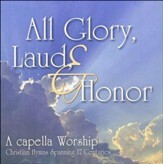 3-CD Set. 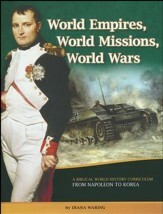 This CD-Set brings the history in Diana Waring's World Empires, World Missions, World Wars curriculum to life. Through engaging audio narratives, Digging Deeper looks at revivals and the hidden stories of the World Wars from a Christian perspective. 3-CD set. 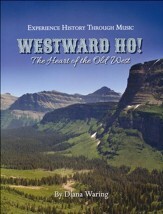 Part three of Diana Waring's popular audio-tour through history, this CD features an overview of modern history. Uncover the secrets behind charismatic leaders, religious freedom, racial reconciliation, genocide, atomic warfare, and tyrannical ideologies. Presented from a biblical worldview, students will be taught history as a series of God-directed events that move both men and nations towards their destiny in Jesus Christ. Tracks cover Napoleon, The Industrial Revolution, the Victorian Era, Darwin, Marx, Livingstone, Prussia, China & Hudson Taylor, the Balkan Wars, WWI, the Axis powers, Jewish Palestine, Pearl Harbor, WWII, Communism, the state of Israel, and more. 4 audio CDs. Grades 5-12. This CD is part of the World Empires, World Missions, World Wars curriculum.